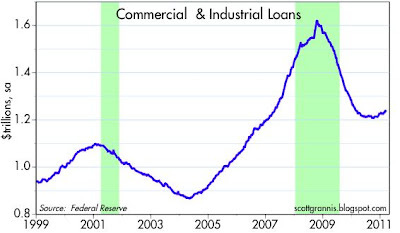 Continuing evidence of an important change on the margin: Commercial & Industrial Loans (bank loans to small and medium-sized businesses) have been rising at an annualized rate of 5.8% for the past six months. This is important evidence of growing confidence among the nation's banks and among smaller businesses. The recession was largely the consequence of a huge loss of confidence in the global banking system, and a pronounced reluctance of banks to lend and businesses and individuals to borrow (manifested in a significant deleveraging of the economy). Therefore an important component of the recovery has been the recovery of this lost confidence. We had a panic-induced plunge in economic activity, and we are still in the midst of a slow but steady process of rebuilding that confidence. There is still lots of room on the upside, since markets are still characterized by caution, not optimism. 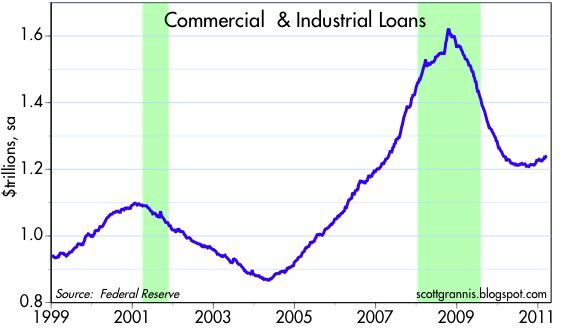 Bank lending is only in the early stages of a recovery, and the economy's demand for liquidity (manifested by the desire to deleverage) is still strong. Well, I'll say it again. Try to get a bank loan for a business, even an SBA loan. You need collateral. Generally, that means property. Property values are depressed. Ergo, hard to get loans. When we can reflate property values, by any means necessary, you will find small businesses getting loans again. I say reflate property values, and I don't care what it takes to do it. BTW, here is an article that ran in National Review Online. I don't know how you get more right-wing than that. It calls for more monetary stimulation.